The Dutch Foundation for Pharmaceutical Statistics (SFK) collects exhaustive data about the use of pharmaceuticals in the Netherlands since 1990. The SFK directly gathers its data from more than 95% of the community pharmacies in the Netherlands. The pharmacies on our panel combined serve about 15.8 million people, dispensing drugs or medical aids some 240 million times per year. For each dispensation, the SFK registers information about the drug supplied, the dispensing pharmacy, the health insurance company that does or does not reimburse the remedy, the prescribing doctor and the patient for whom the prescription was issued. With this, the SFK has the most elaborate collection of data in this field in the Netherlands. Thorough validation routines and well-tried statistical procedures guarantee the high quality and representativeness of the SFK-data. With regard to the registration of data concerning drug consumption, the SFK pays a great deal of attention to the privacy of the parties involved. Privacy regulations guarantee the privacy of the participating pharmacists. With regard to the prescribing doctor and the patient, the SFK only uses anonymously gathered data. promotion of community pharmacist's interests in the Netherlands. Annually the SFK publishes the results of the information gathered during the previous year in the Dutch brochure ‘Data en Feiten’. Every two years we also publish an English translation of the Dutch brochure. Now available is the most recent English translation of ‘Data en Feiten’: ‘Facts and Figures 2017'. This magazine is a result of the information that the SFK gathered during the year 2016, and provides the most complete overview of the development in medicinal use in the Netherlands. 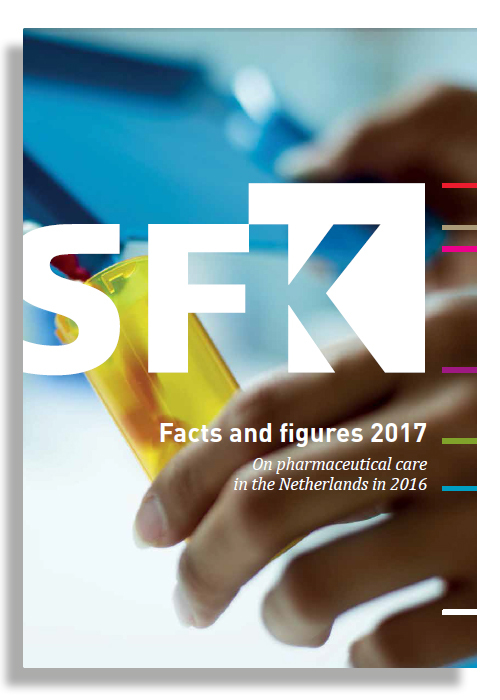 With ‘Facts and Figures 2017’, the SFK offers a practical overview of the latest, most important pharmaceutical data. If you wish to receive a paper-copy of one of the previous editions of Facts and Figures (2000 to 2008), please contact the SFK at info@sfk.nl. Price: € 30,- (including shipping costs). Note that Facts and Figures 2010 is only available in pdf. If you have any questions regarding the SFK or if you would like to submit an information request, you can contact us. A12 towards Den Haag (Utrechtse Baan), at the end turn left (Zuid-Hollandlaan), follow the middle lane, then turn right at the fork (Koningskade), and make sure you take the most left lane. Turn left at the first traffic lights (dr. Kuyperstraat), then turn right on to the third street (Alexanderstraat); our office is established on your right-hand side, number 11. It is possible to park your car behind the building. Please give notice of your presence at our reception desk. At the end of the N44 keep on going straight ahead (Benoordenhoutseweg en Zuid-Hollandlaan), follow the middle lane, then turn right at the fork (Koningskade), and make sure you take the most left lane. Turn left at the first traffic lights (dr. Kuyperstraat), then turn right on to the third street (Alexanderstraat); our office is established on your right-hand side, number 11. It is possible to park your car behind the building. Please give notice of your presence at our reception desk. Bus number 24 (Kijkduin) or 22 (Scheveningen Noorderstrand), get off at stop "Mauritskade". When you get off the bus, turn left and walk towards the statue on the roundabout. Our office is established on your right-hand side, number 11 (Alexanderstraat). Tram number 1 (Scheveningen Noorderstrand), get off at stop "Mauritskade". When you get off the tram or the bus, turn left and walk towards the statue on the roundabout. Our office is established on your right-hand side, number 11 (Alexanderstraat).